SOUR TANG HAS MOVED TO: THEKELLYTANG.COM: Gotta Love Martha!! 1. Dying wooden beads. 2.Big Ball Necklace. 3. 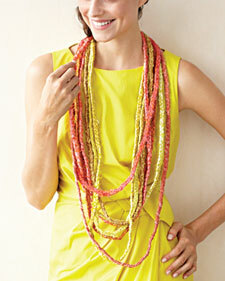 Braided Dupioni Silk Necklace. And these are some of my favorite jewelry ideas from Martha. And yes, I love Martha Stewart.. I mean she's so inspiring considering the empire she has built. And I want to eventually build my own empire!! :) And these are all relatively easy DIY projects. I probably won't create any of these until later. But I am working on some sewing projects right now. + I helped my best friend and talented makeup artist, Lily with her photo shoot for this vampire inspired contest, basically she had to create two different looks one for the day time and one for the night time. Please take a look and vote for her, she is #416! VOTE HERE! + I'm in the planning stages for a lot of my projects right now, and I will hopefully turn them into reality in a couple of months! :) I'll keep you guys updated for sure! wow those are so creative! waiting for your craft post! I love browsing thru Martha Stewart's How-To's and DIY's too! But I find that all the stuff I make don't look half as good as hers when it's completed. Sigh. But in these projects look so gorgeous. I especially love the first one - huge chunky beads, especially w/ that beautiful pastel-blue color scheme = great for Xmas parties. Those necklaces are unbelievable - love layers of necklaces - they are such a huge statement.